Happy hump day crafty friends! 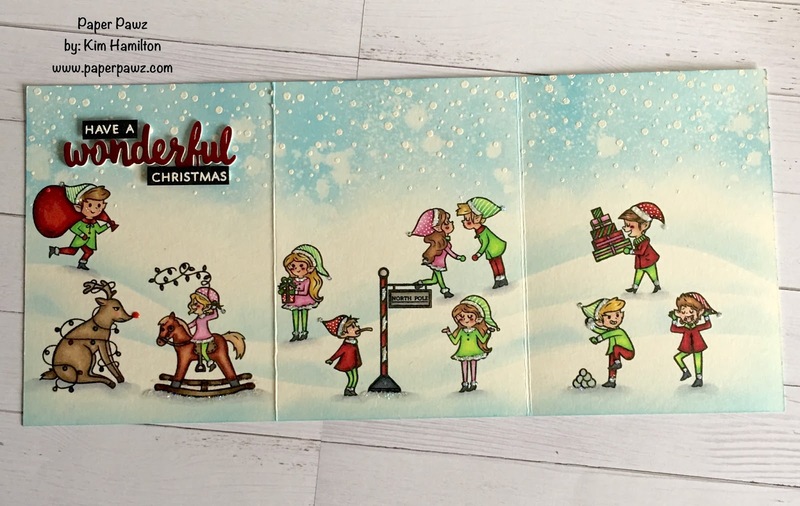 Had such fun with this tri-fold card featuring the new Hero Arts Naughty and Nice Elves. I started with a piece of watercolour (smooth) card stock so that I could cut it 5.5 x 12 to make a tri-fold card base. I then stamped my snow with clear embossing ink by Simon Says Stamp and added my white embossing powder. I used my Salty Ocean Distress Ink for the sky. To make my snow drifts I used a mix of stencils with some Tumbled Glass Distress Ink. I used the lighter ink because I didn't buy the matching dies and I wanted to use my Copics. 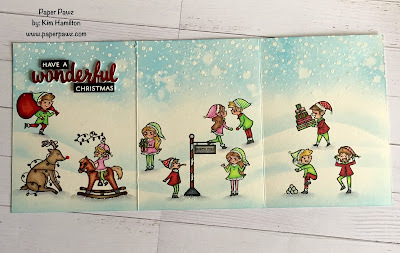 I then stamped all my images from both the Naughty Elves and the Nice Elves sets on different snow drifts. I then coloured them in and added some white Gellyroller detail, Star Dust Stickles and Red Nuvo drops on Rudolph's nose. For the sentiment, I chose another Hero Arts set (I believe it is the Wonderful Stamp and Cut set). I die cut the Wonderful from some fun foam and red mirrored card stock by Tonic and white embossed the accompanying sentiments on black Lawn Fawn card stock. I really love the way it turned out and I plan to use these wonderful elves on gift tags but I am ordering the dies! Lol.